Jo Aleh/Polly Powrie (NZL) secured the 470 Women Open European Championship yesterday. Today Stuart McNay/David Hughes (USA) wrapped up the 470 Men Open title. The European Championship titles go to Ferdinand Gerz/Oliver Szymansk (GER) in the 470 Men and Tina Mrak/Veronika Macarol (SLO) in the 470 Women. Spectacular 4th July celebrations for the USA teams of Stuart McNay/David Hughes (USA) who won overall, whilst teammates Annie Haegar/Briana Provancha took the medal race win to wrap up third place in the 470 Women Open Europeans. 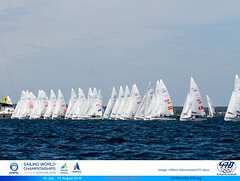 A light breeze again took over the race track today, holding teams under postponement ashore for several hours. It was early afternoon by the time the 470 Women were sent out, completing their race in around 6 knots. As the 470 men took to the track, the breeze was facing, and as the race finished literally died. Perfect timing by the Race Committee who, along with the teams, had waited patiently to optimize the race quality. With the 470 Women Open European title to Jo Aleh/Polly Powrie (NZL), it was mission on for the remaining spots on the overall podium, along with the gold, silver and bronze medals in the 470 Women European Championships. For the Kiwis, the Open Europeans win gave them the only title missing from their bag, and a solid performance of all top five finishes simply left the chasing pack behind. “It’s pretty good to get,” said Aleh. “Although each event is also about what we are learning. For us the result we can’t control so much, but we are pretty happy with the progress we have made this week. But to tie up the title early is extra cool. It makes today quite fun. “This is our fourth European Championships, and we have all the other medals so it is good to get this one to add to the collection,” laughed Aleh. Aleh and Powrie can usually be found with their heads down studying in any spare moments, as they combine completing their degrees and Olympic campaign, but not this week, as Powrie explained. “We are on study break at the moment, so semester two starts next week and we will be back into it then.” Both are studying a Bachelor of Business Studies through the distance learning programme of Massey University. Going into the Medal Race in third place on tiebreak with the French, Slovenia’s Tina Mrak/Veronika Macarol knew the gold medal was in reach but it would take some nerve and a perfectly executed start to face off against the fleet, with several teams in the running for a podium finish. The pressure intensity heightened for the pair, knowing the gold medal was at stake, “After the start and we were a little bit in front of the French, then we were just defending. This is our best result ever. I feel really great, it is fantastic,” said Macarol. The USA’s Annie Haegar/Briana Provancha were intent on upgrading their 4th position from the 2014 Open Europeans, the same position they found themselves going into the medal race. They went all out for the race win, nailed it and converted their score to third overall. Taking out the 470 Women European Championship silver and bronze medals were Camille Lecointre/Helene Defrance (FRA) and Sophie Weguelin/Eilidh McIntyre (GBR). McIntyre was caught between a mix of feelings, as whilst the British had picked up a medal they were not happy with their performance. “It could have been better,” commented McIntyre. “But it could have worse, so we’ll take what we have got. We made some unforced errors in the series, which cost us a lot of points. That has hung with us a bit I guess. There is such fierce competition here. Like the Kiwis, you just can’t let anything go because they’ll take it. Making little mistakes, they take those mistakes and use them, so it is really costly and we just made too many of them." 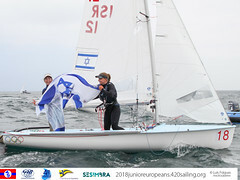 The series lead throughout the 470 Open European Championships was held by one of three teams, and by the end each had secured a place on the podium. The medal race came down to some smart decision making with the points difference giving all to play for. Whilst Aarhus experienced one of its hottest days of the summer, the USA’s Stuart McNay/David Hughes could be found relaxing in the Race Office before racing, as quite simply it was the coolest place at the venue. This approach may have helped their class act on the race track, as the pair combined all their years of experience to secure a second place finish and with it the 470 Men Open European Championship title. “It feels great to win the Europeans and I am still in disbelief right now,” said McNay. “I am sure a couple of hours from now it will hit me, and I will be really happy. Right now it is starting to set in, but still it is something I haven’t done before, so I am not sure how I feel,” he laughed. “It was a pressure cooker, for sure. The wind was so light that there was very little pressure in the boat, so very much a mental game,” McNay continued. 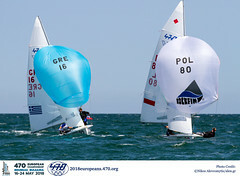 Going into the medal race, Ferdinand Gerz/Oliver Szymanski (GER) held a 4 point advantage over the Americans, but they simple couldn’t compare on the light wind race track. Their 7th place finish dropped them to second overall, but held them firm as the top placed European team to claim the 470 Men European Championship title and gold medals. European gold marks their best performance as a team, and puts them in a strong position closing in on Rio 2016. “We are really happy and proud of our performance here and we are really happy that it is now, one year to the Olympic Games. It is a good time to climb to the podium in this world class fleet. It’s really cool. We definitely didn’t think we would make gold. For us this Championship was important for different aspects. We had to get a good result for our funding, and it’s a European Championship, so of course it is important. The other point is this event was our first qualifier for the Olympics in Rio, and we get a bonus for being top three." The team now return to Germany to defend their 470 German National Championship title in Warnemunde next week. Mat Belcher/Will Ryan (AUS) won the 470 Men Open Europeans in 2013 and 2014, but their title became impossible to defend after opening their 2015 assault on the backburner. A 3rd in the medal race, pushed them to third overall. Greece’s Panagiotis Mantis/Pavlis Kagialis finished in 4th overall and sealed the European Championship silver medal. A noticeable shift in form saw Russia’s Pavel Sozykin/Denis Gribanov lead the series until race 4, rewarding the team with their best ever result at a major international event, 5th overall and the European Championship bronze medal. Argentina’s Lucas Calabrese/Juan de la Fuente forced others to walk in their shadow by winning the medal race, to finish in 7th overall. The 2012 Olympic bronze medallists’ mission is to now secure Olympic qualification for Rio 2016, with the next opportunity being the 2015 470 World Championships in Haifa, Israel. Most teams will now take a well-earned break to recover from the physical demands of the Championship, before heading to the next event, which for some will be the Rio Test Event from 15-22 August in Brazil. Junior teams are moving on to the 470 Junior World Championships, 24-31 July in Thessaloniki, Greece and the 470 Junior European Championships, 8-15 August in Bourgas, Bulgaria. The 2015 470 World Championships take place in Haifa, Israel, from 10-17 October. Nikos Alevromitis of aleN Photography is the Official Championship Photographer and can be contacted on alen@alen.gr. Daily photo galleries are available on Facebook. The 2012 Olympic gold medallists Jo Aleh/Polly Powrie (NZL) knocked out two wins, a feat repeated by 2012 Olympic gold medallist Mat Belcher and crew Will Ryan in the 470 men fleet. Teams really got to stretch their legs in today’s two races, as the breeze increased and a swell pushed through the course area, with the change of wind direction. The outcome of two race wins for the Kiwis sees their points lead extend, as they hold a 24 point advantage over second placed Camille Lecointre/Helene Defrance (FRA). Slovenia’s Tina Mrak/Veronika Macarol (SLO) move up to third, on tiebreak with the French. Overnight leaders Ferdinand Gerz/Oliver Szymanksi (GER) still wear the leaders’ yellow jerseys from their 4,12 scorecard today, but the points gap is closing in on them. Stuart McNay/David Hughes (USA) now sit just 4 points behind, with Panagotis Mantis/Pavlos Kagialis (GRE) in third. Mat Belcher/Will Ryan (AUS) are just 1 point behind the Greeks in fourth.